Perhaps this is how the “trickle down” theory of economics works. 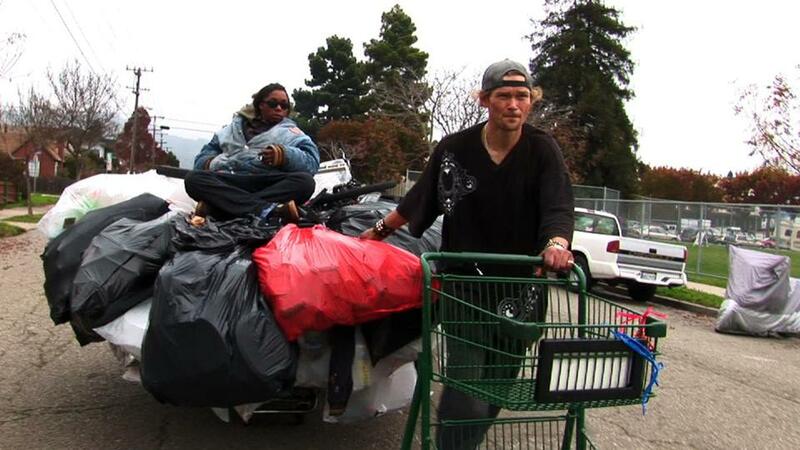 They are a part of the urban landscape — homeless people with shopping carts overflowing with bags of cans and bottles and other discards to be redeemed for cash at recycling centers. West Oakland, a.k.a. Dogtown, is the site of one such center, and Amir Soltani and Chihiro Wimbush’s immersive and wrenching documentary “Dogtown Redemption” (Monday, 10 p.m. on PBS) profiles three of those who depend on it for their marginal livelihoods over a period of seven years. If there were a Guinness record for loading a shopping cart, Jason Witt would probably win it. He estimates that his perfectly balanced, precarious-looking loads weigh in at around a quarter of a ton. But his reign as the king of cans might be nearing its end, as his HIV condition worsens. Landon Goodwin, the wryly witty former preacher, now a crack addict, seeks to rehabilitate himself and do good deeds for fellow sinners after a beating by four punks with lead pipes nearly kills him. In footage from 1985, Miss Hayok Kay looks vibrant, joyous, and beautiful as the hip drummer of a punk band. Nearly 30 years later, she has become an alcoholic. Ostracized by her prominent family, she survives on the streets by collecting cans. Her worn and battered face and hands make her look decades older than her 50-something years as she tells her story while eating ramen noodles plucked from a garbage can. Soltani and Wimbush know their subject is affecting enough without resorting to histrionics. They subtly unfold the unexpected details of these three lives — key revelations involve a gravesite, a young son, and dim recollections of sexual abuse, which is hinted at and returned to with added detail. The cumulative cinematic effect is powerful and emotional, similar in style and content to “Foreign Parts” (2010), the hauntingly tragic documentary from Véréna Paravel and JP Sniadecki from Harvard’s Sensory Ethnography Lab. After watching “Dogtown Redemption” you might not look at these urban recyclers — or think about the word “redemption” — the same way again. For more information go to www.pbs.org/independentlens/films/dogtown-redemption/. Remember ISIS? It seems as though no one in the media does, judging by news coverage that feeds so heavily off the schoolyard spat that the presidential election has become. Well-rounded viewers can fill in the gap by watching Frontline’s taut report “The Secret History of ISIS” (Tuesday, 10 p.m. on PBS), directed by Boston-based producer and journalist Michael Kirk, before the next bloody headline about the terrorist army and would-be caliphate outrages the world. “History” begins in the aftermath of 9/11, when the Bush administration was determined to link Al Qaeda to Saddam Hussein to justify the invasion of Iraq. The CIA, however, suggested they first take care of this upstart terrorist Abu Musab al Zarqawi, who was prepping for insurgency in an Iraqi jihadist training camp. The administration declined, not wanting to prematurely show their hand and detract from the shock and awe of their imminent air strikes against Baghdad. Instead, they saw Zarqawi as additional evidence of Hussein’s connection with Al Qaeda — even though the yet little-known Zarqawi, according to the CIA, had no affiliation with Osama bin Laden (he once tried to meet with the Al Qaeda head, but bin Laden dismissed him as a “thug”) or Hussein (who would have killed Zarqawi as an enemy of the state). But those details did not prevent the bogus Zarqawi link from being included as a key point in Colin Powell’s speech to the United Nations seeking authorization for an invasion, thus falsely justifying the war and elevating the aspiring jihadist from obscurity to international, though as yet undeserved, infamy. Further miscalculations — such as disbanding the Iraqi army and putting 250,000 angry, armed people out of work and into the streets — played into Zarqawi’s scheme to provoke civil war and thus create an opportunity to establish a new, autonomous Islamic state — a caliphate. If the Bush administration was too eager to engage in war, the film argues, President Obama was too hesitant to do so. Having promised during his campaign to withdraw US forces from Iraq, Obama did not react soon enough to the growing threat of ISIS, now led by the even more ruthless and formidable Abu Bakr al-Baghdadi after Zarqawi was killed in an airstrike. Briskly argued and elucidated, “The Secret History of ISIS” can be seen on Tuesday at 10 p.m. on PBS. Perhaps the history wouldn’t have been so secret if anyone was paying attention. For more information go to www.pbs.org/wgbh/frontline/film/the-secret-history-of-isis. Basil Bunting, who died in 1985 at the age of 85, is Britain’s greatest little-known modernist poet. He was a Quaker who was imprisoned as a conscientious objector during World War I. He sailed around Italy with Ezra Pound during that poet’s time at Rapallo. During World War II, he was a British intelligence officer in Persia. And as a youth he loved a girl he never forgot. Many of those events are explored in his most famous poem, the autobiographical “Briggflats” (1965), named after the Quaker meeting house in Cumbria, where he is buried. Philip Trevelyan, who is alive and well at age 72, is perhaps Britain’s greatest little-known documentarian. The son of a painter and potter, Trevelyan sought in his films to celebrate the art, lives, and industry of the common people. His documentary “Basil Bunting” (1982), the last in a series of his films at the Harvard Film Archive, combines Bunting’s incantatory recitation of that poem with conversations with the poet and glimpses of his life. This is a great opportunity to discover two artists you might not know about, in one film. “Basil Bunting” screens Sunday at 5 p.m. at the Harvard Film Archive.